This tin and Reading Monster colorway is limited to 3 and will be available along with the Silver/Black Fades. 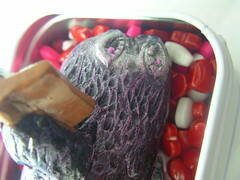 Bloody Valentine Reading Monster is numbered and packaged in a custom metal tin with surprise extras. Translucent Blood Red Resin with Metallic Pink, Blue and Silver.